« Ezekiel 37: Pope Francis misunderstands it–what about you? The EU on Nov.13 officially launched a new era in defense cooperation with a program of joint military investment in equipment, research and development, known as permanent structured cooperation, or PESCO. Foreign and defense ministers gathered at a signing ceremony in Brussels to represent 23 EU governments joining the pact, which is to become legally binding when signed by heads of state at EU summit in mid-December. With so many ministers signing, approval seems a given. From now on, the EU will have a more coherent role in tackling international crises, while reducing the reliance on the United States. The UK, which is scheduled to leave the EU in 2019, is not part of PESCO. Until Brexit, London had opposed the idea of European Defense Union or European Army, saying it would undermine NATO and the UK alliance with the US. Denmark, which has a special opt-out status, is not expected to participate. Ireland, Portugal and Malta are still undecided whether or not to join. Donald Trump became US president and made the EU really sit up and take note. Trump had previously called NATO “obsolete” during his election campaign, and spoke evasively over his support for the alliance’s cornerstone Article Five clause which decrees that “an attack against one ally is considered an attack against all.” “There’s a sense among European capitals… that Europe can’t take the American security umbrella for granted,” says Dempsey. Notice that the United Kingdom is not part of PESCO and was historically against Europe having its own combined army, independent of NATO. That used to basically also be the position of the USA. Most Europeans also did not want to have a massive European military. Now, with the Brexit vote and the rise of Donald Trump, the situation has changed. Brexit and Donald Trump are being credited for prompting the Europeans into making the PESCO deal. Why would some European leaders start to push for a superstate now? the militaristic superstate that the Bible refers to as the ‘Beast of the Sea’ (Revelation 13:1=10) will arise. The monstrous superstate will come–and it will destroy the United Kingdom (and the United States and others for that matter, cf. Daniel 11:39). A couple of days after that, we put together a video titled: Forbes’ Brexit Monster is the Beast of Revelation. Europe will arise. After the Brexit vote (the vote in the UK to leave the European Union; watch also Forbes’ Brexit Monster is the Beast of Revelation and/or Post Brexit Prophecy), some in Europe are now starting to tell the world publicly that it intends to do so militarily. The world will be surprised this will happen, which is part of why I believe European technology will be a key factor in this (as will be deception and problems in the USA). I do not, at this time, believe that Europe will abandon NATO. But that Europe wants the ability to have significant military capabilities outside of NATO, which NATO countries like the USA have. As have suggested before, eventually and perhaps under the guise of a NATO exercise, Europe will launch a surprise attack against the USA (cf. 1 Thessalonians 5:3; Daniel 11:39). This would possibly happen after one or more trade disputes, and perhaps after the USA has been weakened by weather problems, terrorist acts (from likely Islamic sources allied with Europe, per Psalm 83:3-8), war, riots, solar flares, severe earthquakes, civil unrest, devastation of their genetically-modified food supplies, food shortages, and/or various pestilences–an intensity of “sorrows” such as Jesus discussed in Matthew 24:4-8 leading up to the time of the Great Tribulation. Disasters, especially if there is an ElectroMagnetic Pulse (emp) attack or a severe solar flare storm, could be part of a so-called “perfect storm” of events that could set up the USA for destruction. I suspect that after the Europeans and the USA have some strained relations in the future, the Europeans may call for/agree to a joint military exercise, possibly under the conditions of NATO, in the USA. This would allow the Europeans to bring military aircraft, troops, and other military items to the USA, without the USA getting concerned it would soon be attacked. As far as the UK goes, it is losing its voice of influence within Europe. The UK will ultimately be defeated by a power from Europe, as will the USA (cf. Daniel 8:25; 11:39; Isaiah 10:5-12; Jeremiah 30:7; Psalm 83:3-8). Currently, Europe has many ‘armies.’ Various biblical prophecies show that Europe will reorganize (Revelation 17:12-13) and will end up with its own military (e.g. Isaiah 10:5-12; Daniel 11:25-43). Germany, France and Italy — cling to delusions of grandeur. They have drawn up plans for a European Union army and deeper EU defense integration, claiming that this will enhance European security. 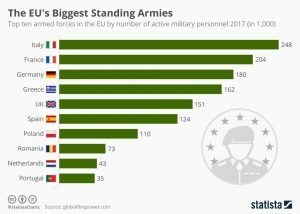 While it is true that such an army will reduce U.S. influence and not work out in America’s interests, it is not delusional to believe that there will be a European army. Since the Bible says Europe will have a “great army” (Daniel 11:25), Europe will end up with a great army. Donald Trump’s rise has encouraged some in Europe to more publicly promote this idea. Donald Trump seems to be a catalyst for that and other militaristic moves in Europe. PESCO is essentially a step that the Europeans believe is needed because of Brexit and Donald Trump. Of course, there have been leaders in Europe that have wanted this for decades. But Donald Trump and the Brexit vote are giving them backing from more in Europe to form its own army. This leader will seem to be a peace-maker. But he will be a warring beast. While Satan will be on his side (cf. Revelation 16:13-14), it may also be that he may use the power of NATO in order to eliminate his enemies. Since the USA has the strongest military in the 21st century, this is a prophecy against it, and, to a lessor degree, its Anglo-Saxon descended allies (see also USA in Prophecy: The Strongest Fortresses). We are seeing Europe changing and working to build its military. PESCO is a step in that direction (see also ‘PESCO helps to ensure a more secure Europe for its citizens’). The current Anglo-American dominated world order will NOT continue (watch End of the Anglo-American Order and/or The New World Order Is Leaving the US Behind)–Europe will have a great army (Daniel 11:25). This entry was posted on Thursday, November 16th, 2017 at 7:30 am	and is filed under Prophecy.